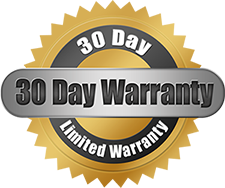 All of our parts come with a standard 30 day feel good warranty. Nobody wants to shell out their hard earned cash for a piece of junk. To us, a used part is worthless without a warranty, that's why every part we sell comes with one. Whether you just want the minimum protection, or you want the comfort of an upgrade, we give you the choices that will fit your repair. See our Downloads page for complete terms.